Normally a new golf retailing website would not be news in the 21st century, but for the launch of the www.ForemostGolf.com I will make an exception. This is because Foremost is the biggest golf buying network of PGA professionals in the UK and their foray into the world of online retailing finally marks the acceptance by a large number of golf pro shops that the internet is not going to go away and that they had better join the party. Whilst you could not accuse Foremost of being quick off the mark with internet retailing, the timing is probably right in terms of acceptance amongst the green grass trade for online retailing and the critical mass of golfers willing to buy online. The other factor in their favour is the rise of multi-channel retailing as the preferred option, where an online store is complimented by telesales and a national offline presence. Since 2000 the online golf industry saw a large number of small offline stores and indivudual pro-shops create an online store to increase sales in the retail nirvana of the world wide web. Back then price competition was intense and a lot of retailers were busy making a lot of sales and not much profit. Now into the second decade of the century the shake out has left large multichannel retailers like American Golf (who also own Online Golf), Direct Golf and GolfOnline to divide the spoils. Foremost have a network of 950 pro shops in Great Britain and Ireland to provide the support and the offline re-assurance that customers prefer, combined with the collective buying power to be competitive. The unique aspect to their service is that every sale is associated with a Foremost pro-shop account whether you select one or not, so you have a point of contact if you need it. Delivery is chargeable depending on the order value, or free regardless of order value if you opt to use the Click & Collect service from your local Foremost store. When you enter your details for the first time you select a Foremost store to be associated with and this is where your Click & Collect orders are delivered for you to collect for free. If you wish to change the store over time then this is possible too. 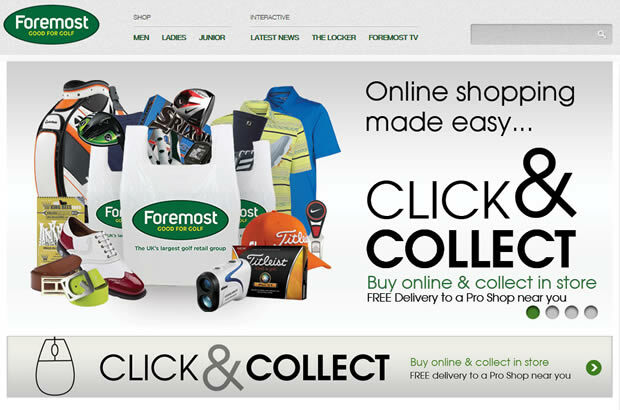 An added bonus for Foremost Pro’s is that they can now increase the stock they can offer members and visitors to their shops as the full range of clubs, clothing and shoes in every colour and size is available at the click of a mouse for delivery in a couple of days. Maybe we will see a keyboard and a large screen in every pro shop soon rather than racks of clubs? All sounds good, so I thought I would do a bit of mystery shopping to see if it worked in practice. 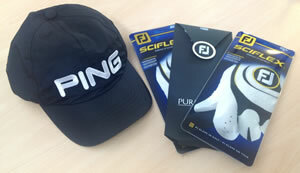 The ForemostGolf.com site is functional and the navigation worked well to enable you to find what you wanted. The buying process was straightforward enough and I selected my nearest Foremost pro shop from a list of the nearest to me by postcode. A few days later I got an email saying my order of a few gloves and a waterproof cap for winter had arrived at Swanston Golf Club and I duly went along and collected my goods, so overall the service worked well. Foremost hope the website will also reach nomadic golfers and non-golfers buying for golfers who will never go into a traditional pro-shop, so this is a good development for pro-shops in their network. The option of a free off-line collection point will be great for those who are out during the day when deliveries are usually made. However most of the big retailers deliver larger orders free to a work address so it will depend on the customer whether that works better for them than making a trip to the local golf club. It is also a different game online and whilst CEO Paul Hedges says that the site is principally there to support their pro’s, the hard fact is that they are competing in the virtual world against online retailers with a 15 year head start. However they can afford to be patient as they already have the warehouses and distribution infrastructure in place. This is a big step forward for Foremost and we hope it works for them as any development that brings the green grass world of golf online should be warmly welcomed, as that is increasingly where golfers want it to be.